This is an extremely poorly paced issue. It's not terribly written, but it achieves what it sets out to do very slowly and doesn't leave any truly progressive story material until the very last few pages. This has been a problem with this book for a while now. This whole arc, since about #25, may read very well in trade but it frustrates me to no end on a monthly basis. 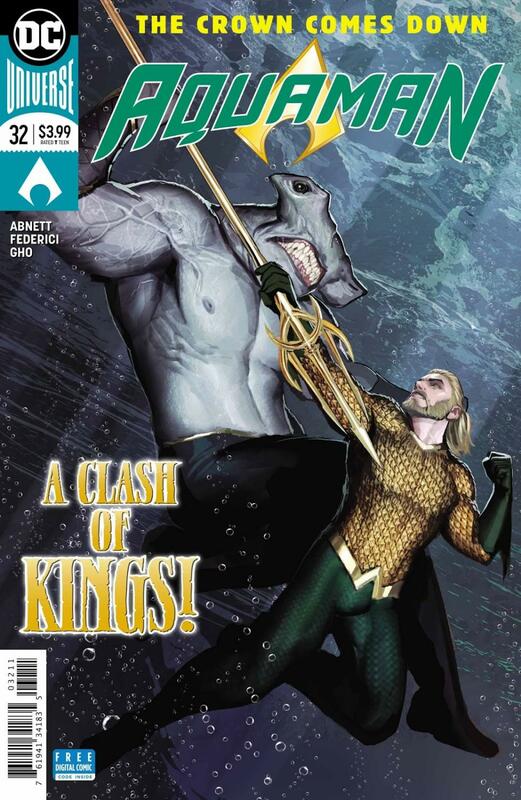 Most of this issue is concerned with recapping information that we were given many issues ago, that Mera is to be Queen of Atlantis and Arthur must be convinced. Unfortunately this scene drags on for pages and pages, and then Mera explains her reasoning for pages and pages. It's simply boring to read. I'm just thankful that Dan Abnett suddenly places a timer on the story essentially, as it just jumpstarts very near the end which I hope will continue to give this book a fresher and more exciting pace. Riccardo Federici's art is, as I said for last issue, pretty fantastic. I still enjoy it more than Stjepan Sejic's art, and Rick Leonardi provides the breakdowns for this issue. Sunny Gho's colouring really grounds and complements Federici's work extremely well, resulting in a truly gorgeous book. This is simply the most beautiful this book has looked in a very long time. I do have an issue with Gho clearly miscolouring an aspect of Superman's outfit in a flashback panel. It's pretty outrageous.